The Common Spikerush is a perennial, fast growing, flowering grass that grows in every state except Georgia and Florida, as can also be found in Asia and Northern Europe. They need moist to wet soil with a PH of 5.5-7.0 and full sun. You can see them in mountainous bogs, in drainage ditches, along with the side of streams, in wetlands and coastal swamps. Common Spikerush plants will grow to be between 1.6’-3.3’ high and can live for 20 years. They can be used in bird gardens or to fill in large areas that are bare in fields and lawns. The Common Spikerush grows in clumps and will stay green all year long. It has very simple leaves that press close to the lower portion of the stem. At the tip of the unbranched stems, you will find a small cone or ball that is enclosed by a black or dark brown bract. That cone is the flower cluster. Each flower cluster will have at least ten flowers, and each flower will have a purplish brown leaf. The fruit of the Common Spikerush has a single seed and is hard and nut-like. A wide variety of wetland birds depend on this fruit for their food. 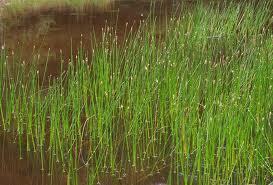 Common Spike Rush is an aquatic plant suitable for wet soils, water ponds, and aquariums. They are super thin elongated spikes that grow in bunches or clumps. The peaks can fully grow underwater till they eventually submerge to the water surface, reaching up to four feet. This plant can be used as a beautiful accent for your aquarium and offers a fish habitat similar to that of a real pond. Each spike bears a ripe single-seeded fruit at the tip of their stems during late summer. The fruit may carry golden yellow and is nutritional for birds. These rushes are low maintenance and thrive with minimal effort from owners.